Four new members joined ANPS for this field trip. 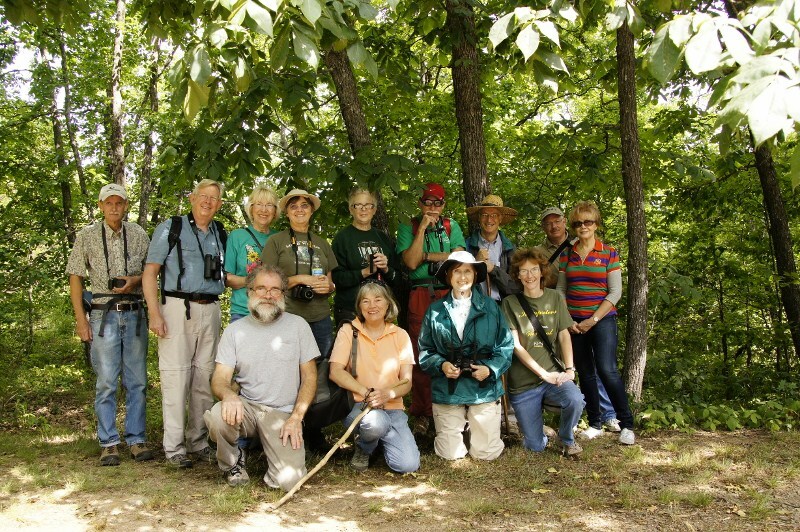 The Arkansas Native Plant Society field trip on 2,753-feet-high Mt. Magazine on June 2, 2012 drew 14 people and dozens of butterflies. And this was scarcely odd because Lori Spencer, author of the comprehensive, beautifully illustrated field guide, Arkansas Butterflies and Moths, was our trip leader. The walk went out from Brown Springs over the thinly wooded western ridge and, right from the start, butterflies in abundance seemed to have us on their schedule. And guess what? Just like the plants, it turns out, the butterflies all have names! Oh I suspected as much—but how pleasant and informative to have those suspicions confirmed. For example, the colorful array of pollinators decorating the bright orange butterfly weed included a male Diana, a few orange sulphurs, and a coral hairstreak. A zebra swallowtail was plying the Arkansas calamint. And a snowberry clearwing moth larva identified its host plant for us: horse-gentian (Triosteum perfoliatum). What clever taxonomists these insects are! The field trip’s botany guides, Larry Price and Eric Sundell, couldn’t quite remember what the sterile wildflower with the opposite, clasping leaves was. 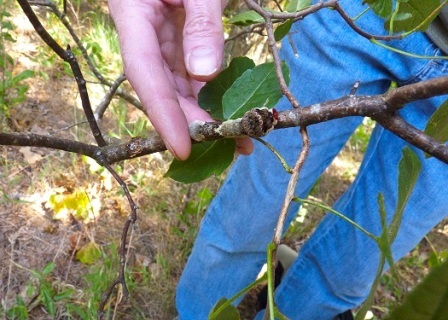 But the larva reminded us that “snowberry,” being congeneric with our common Arkansas coralberry (Symphoricarpos orbiculatus), is a member of the honeysuckle family, Caprifoliaceae. And with those hints from a moth larva, the wildflower book quickly yielded the name of our unknown. 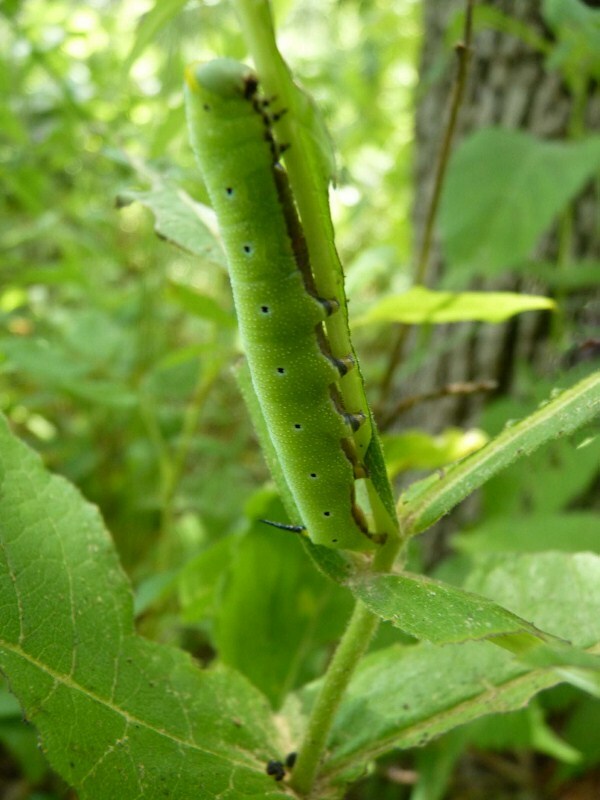 The most exciting butterfly encounter started when Don Simons discovered caterpillars of the giant swallowtail feeding on one of the numerous wafer-ash (Ptelea trifoliata) bushes along the way. Don, Lori’s husband, is Park Interpreter at Mt. Magazine State Park (Lori is Chief Volunteer) as well as the illustrator of her butterfly and moth field guide. Giant swallowtail caterpillars do not like to be disturbed, and to facilitate that, they take on the coloring of bird droppings, an unsavory shiny mottling of gray, white, and black. The cryptic coloring must be very effective. Nevertheless there is in reserve a Plan B, which Lori demonstrated by gently harassing the caterpillars with her finger. Two bright red horns emerge from the head and broadcast the unpleasant smell of something like Parmesan cheese—not nearly as bad as a ginkgo seed coat, but apparently bad enough to discourage some predators who have seen through the bird dropping disguise. Our woodroad (locally known as “the fire line”) took us through open woods dominated by a variety of upland oaks—post, black, blackjack, some northern red, and most interesting, a few maple-leaf oaks (Quercus acerifolia), a species of scrub oak known worldwide from only four populations at rather high elevation in the Arkansas River Valley and Ouachita Mountains within Arkansas, making it one of the state’s ten endemic plants. The common hickory along our path was the uncommon pignut hickory (Carya glabra). Pignut is the dominant hickory in much of North America’s eastern forests, from the Mississippi River to the Atlantic Coast. But in Arkansas the species is rare or at least certainly problematic—so much so that Dwight Moore fails to include or even mention the species in his (otherwise) very accurate and helpful handbook (published by the Arkansas Forestry Commission), Trees of Arkansas. Hophornbeam was common and unusually showy; the species is typically an understory tree that bears its interesting fruit a little too high to be fully appreciated. But here, on the open, savanna-like ridge, the trees are hung with their false hops at eye level and extremely decorative. Three shrubs were abundant: wafer-ash or hoptree, loaded with handsome, elm-like fruit; grancy graybeard or fringe tree (Chionanthus virginicus), unfortunately past bloom; and winged sumac (Rhus copallinum), with that elegant foliage. Mt. 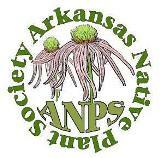 Magazine is a kind of elevated island in the Arkansas River Valley, and botanically, its habitats support a number of plant species that are rare elsewhere in Arkansas. We saw several of those species, although (full disclosure) none of them was in its prime: western wallflower (Erysimum capitatum), yellow nailwort (Paronychia virginica), crinkled hairgrass (Deschampsia flexuosa), and on the cliffs across an immense gap from Lori Falls—the spectacular crag where our group rested before turning back—large tufts of the 2 to 3-feet-long fronds of hay-scented fern (Dennstaedtia punctilobula), common as a weed in New England but rare and local in hot, dry Arkansas—well, at least I think they were hay-scented ferns, but I couldn’t check the fruit dots with my hand lens from 100-200 feet away. Lori thought she remembered that they were just the common marginal shield fern (Dryopteris marginalis). I have not added hay-scented fern to my Arkansas life list. Thanks to Lori Spencer and Don Simons for one of the most pleasant botanical excursions in recent memory. ANPS will be back on Mt. Magazine for our Spring 2013 meeting. 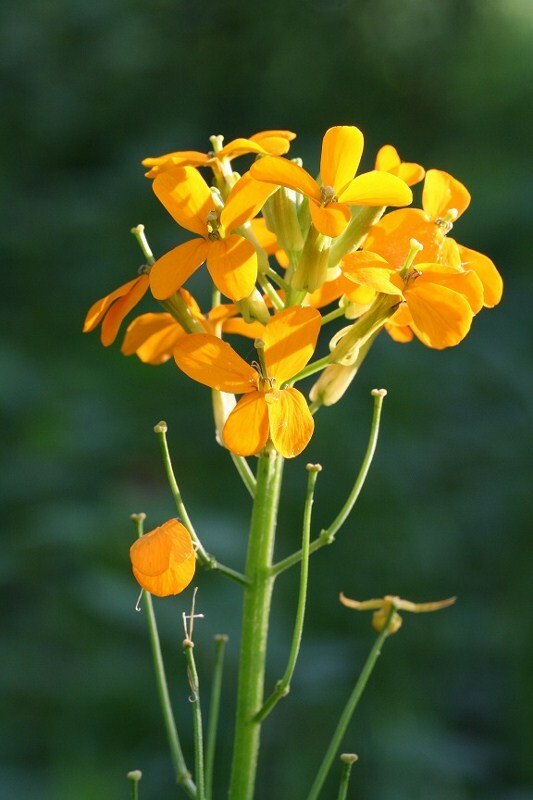 If the timing is right, we’ll enjoy western wallflower in bloom along with Turk’s-cap lily, yellow honeysuckle, prickly gooseberry, mock orange, and plenty of other delightful things that we lowlanders seldom get to see. Mark your calendars for April 26-28, 2013. P.S. So much to see on that field trip, we had to include a few extra photos. 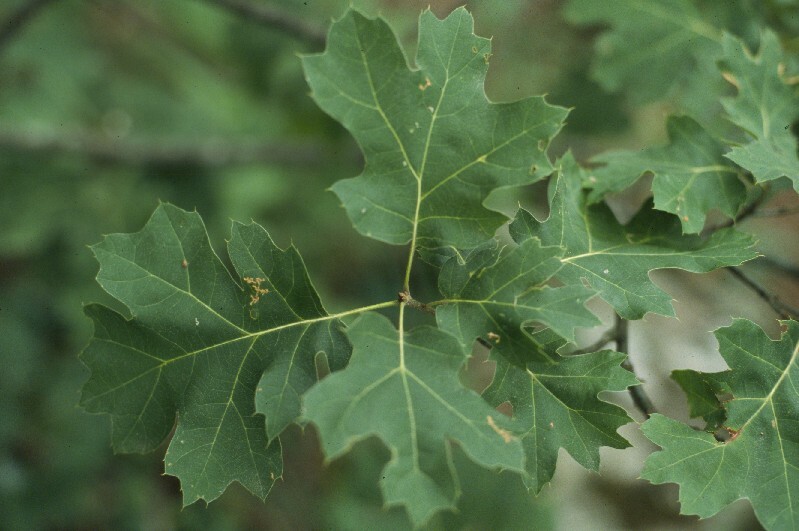 The scrubby, rare, bizarre maple-leaf oak (Quercus acerifolia) is an Arkansas endemic, known from only four sites of relatively high elevation in the Arkansas River Valley and Ouachita Mountains. Like maple-leaf oak and western wallflower, yellow nailwort (Paronychia virginica) is another of Mt. Magazine’s botanical treasures, known to occur in Arkansas in only six counties: Logan, Faulkner, Montgomery, Garland, Searcy, and Van Buren. 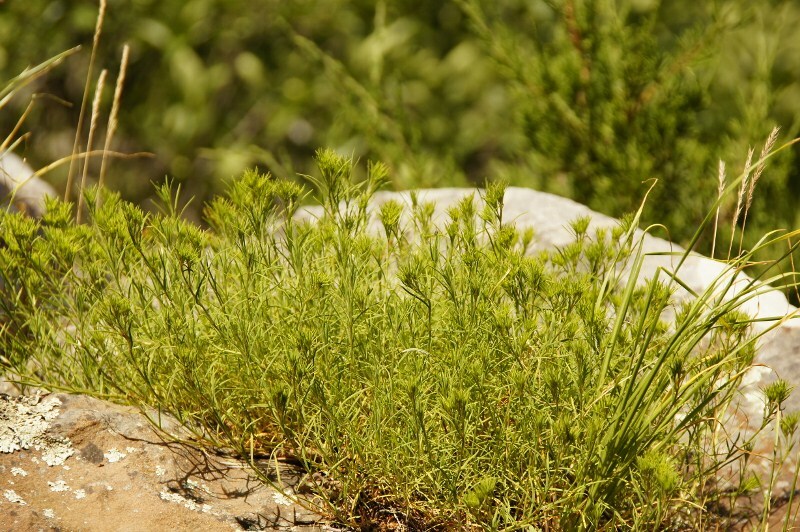 The mat-forming perennial is a lover of rocks and ledges and blooms in late summer and fall. Western wallflower (Erysimum capitatum) is widespread and very common in western North America from the Pacific states and provinces eastward to the Rocky Mountains and Great Plains. In the East, the species is local and uncommon, and in Arkansas it is known from only a few populations in three counties, one atop Mt. Magazine. Unfortunately, we missed the flowers (shown here blooming in May) but did catch the young fruit. This entry was posted in Field Trips and tagged Lori Spencer, Mt Magazine. Bookmark the permalink.